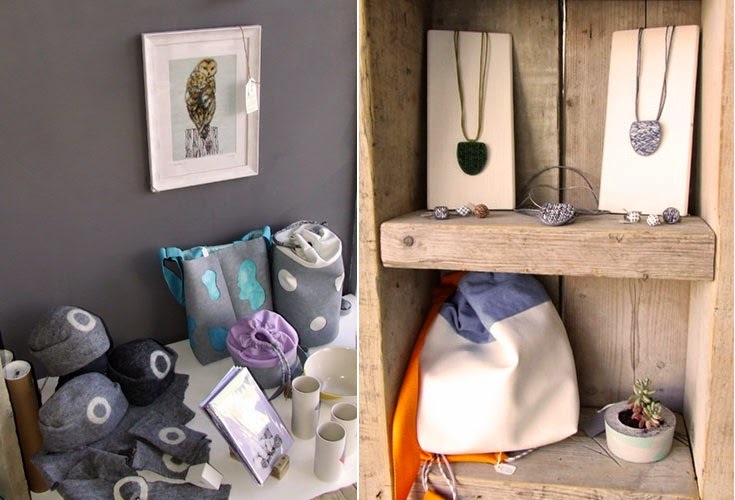 National Craft and Design Fair in the RDS, Dublin, Ireland 3rd Dec - 7th Dec 2014. 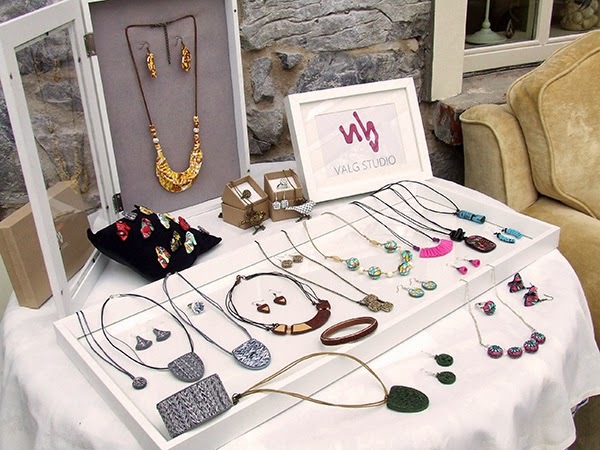 The days are getting colder and countdown has begun for the RDS National Crafts & Design Fair here at Valg Studio. 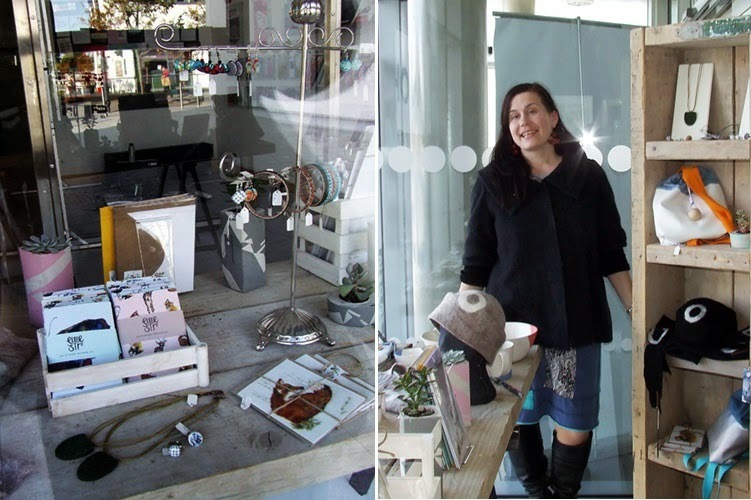 For anyone interested to know a little bit more about the fair here is a lovely introduction I found on National Craft & Design Fair website. 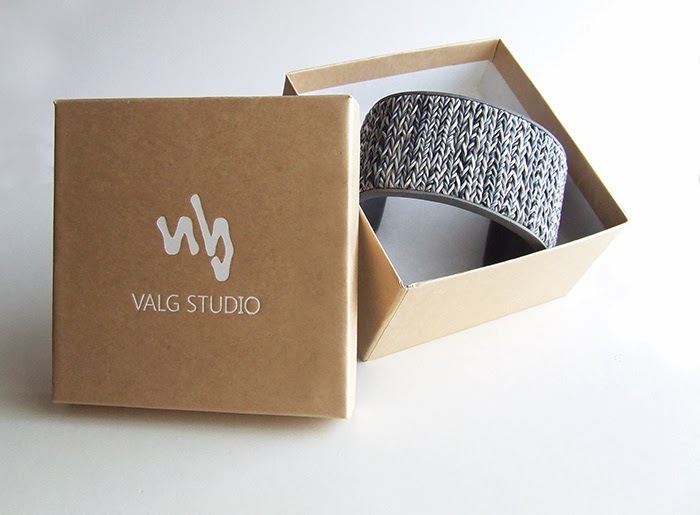 All the information you need about the fair is available online, including a free gift guide featuring blue flower rings and knit inspired jewellery range by Valg Studio. "Whether you are a confirmed shopaholic or completely phobic about shopping, the annual National Crafts & Design Fair, is just the place for you. For those who love shopping it’s the chance to browse and enjoy the unique work of more than 500 designers, artists, and craftspeople who will be taking part in the country’s largest celebration of crafts. But if shopping just isn’t your thing, think of it as a heaven sent opportunity to buy all your Christmas gifts in a single shopping session!" Click HERE and browse this beautiful RDS National Craft and Design Gift Guide online. 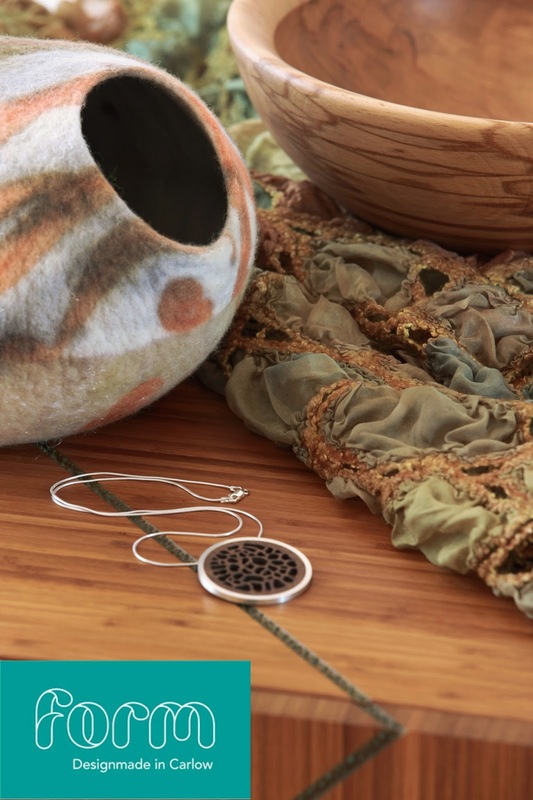 National Craft and Design Fair, image courtesy SidewalkSafari. Our stand B16 will be located on the balcony of the main hall. 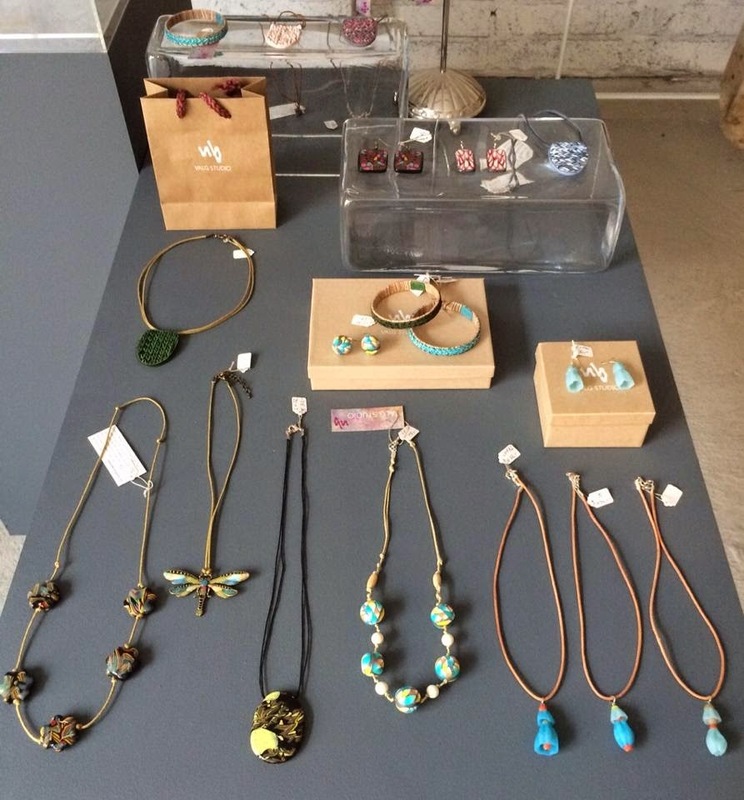 Stop by and see our floral and knit inspired jewellery range, you will find some old favourites, best sellers and of course new stock. 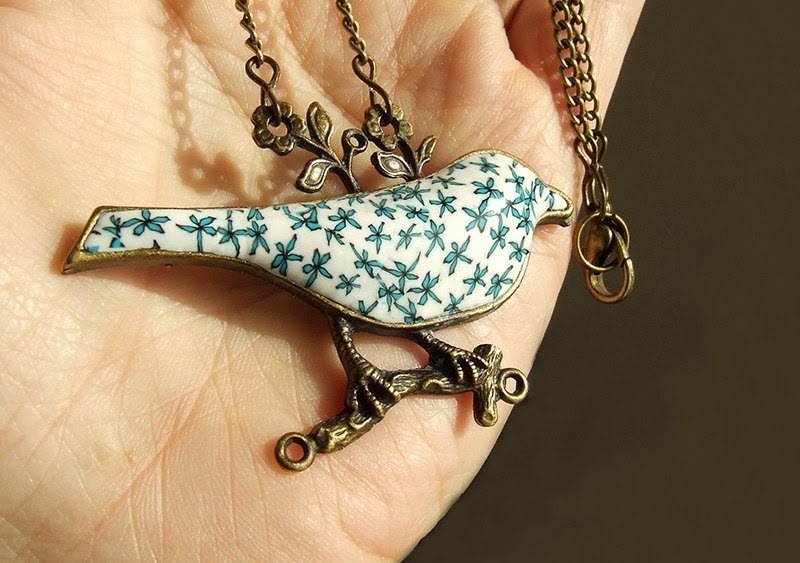 We will be showing some new brooches and pendants! Every piece comes gift boxed and ready for gift giving. "Many of Ireland’s most respected craftspeople will be there, showing and selling top quality goods. The range is dazzling – everything from chocolates to high fashion, and because the goods are handmade by craftspeople, they have the added distinction of each one being unique." Enjoy the pre holiday season and maybe we will meet at the Fair! 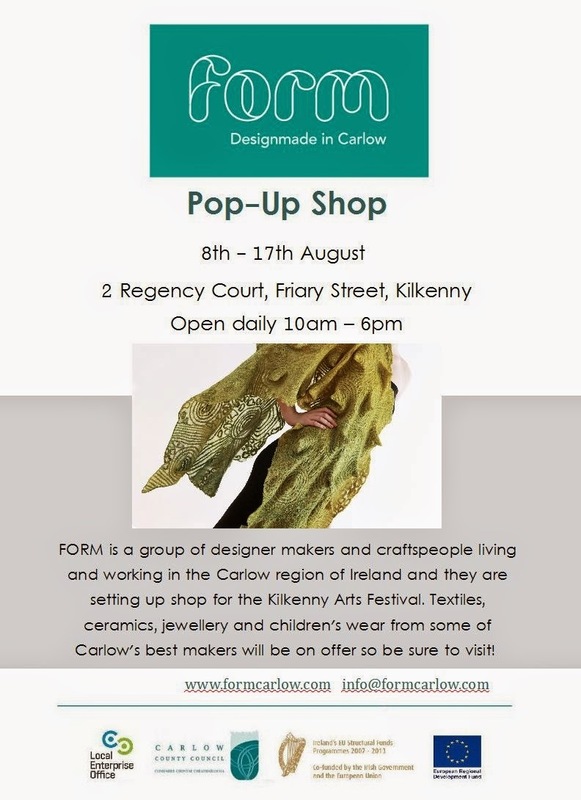 As mentioned before in August Valg Studio have been busy involved with FORM Designmade in Carlow Pop - Up shop during Kilkenny Arts Festival. 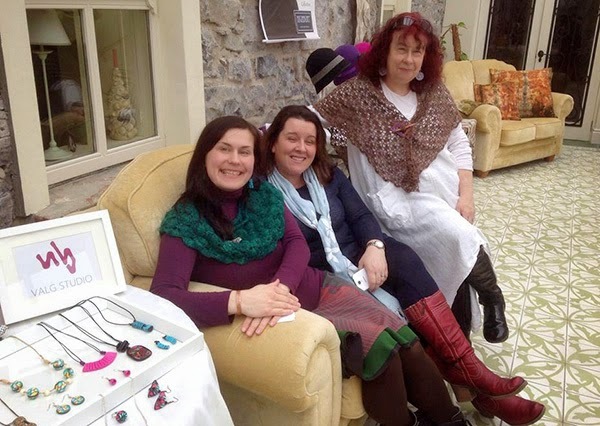 Exhibiting a selection of art & craft work from county Carlow based designers, artists and makers on Friary Street was a pleasure for us all. 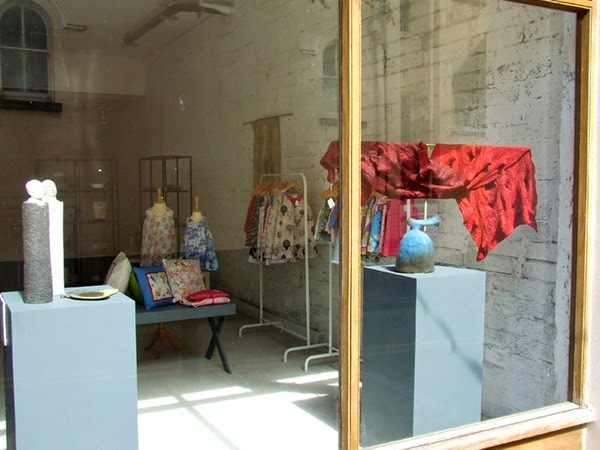 The Arts Festival is over and FORM pop - up shop on Friary Street is now closed. It has been great to participate and I miss our beautiful shop already. However I would like to share some thoughts and images from this recent experience. When on the first preparation day I saw the shop unit I wasn't sure will we be able to fill it - it was huge, but it worked out perfectly. I learned that it is important to give a space to the work and also our visitors could comfortably walk around the shop. It was almost one of those last minute decisions to set up a pop - up shop during this arts festival and if not a great team work it may be a completely different story. We are a new group and it was great to work together and learn something new about each other. Great feedback and support was shown the group in Kilkenny. Thank you to everyone who wished well and visited! Part of the Valg Studio display at FORM Pop - Up shop. FORM Pop -Up Shop window display on Friary Street. 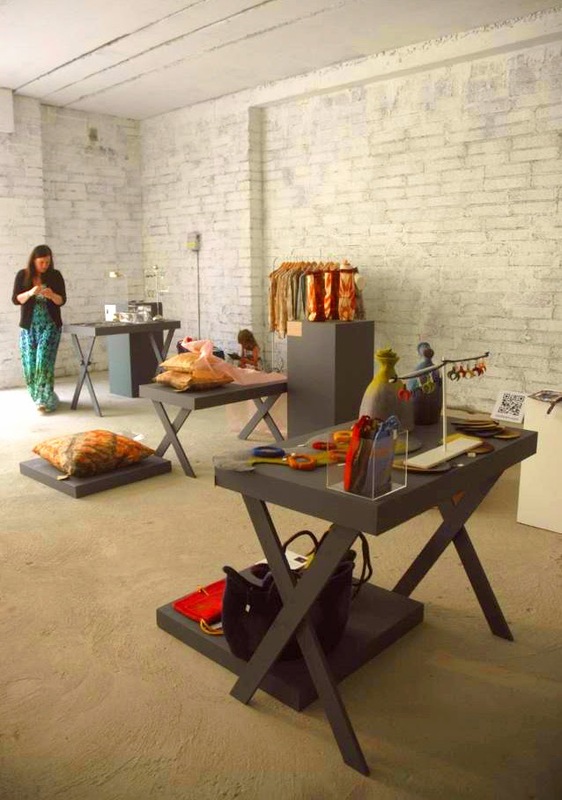 FORM Pop - Up Shop interior during Kilkenny Arts Festival. I can't imagine summer without the Festivals and no doubt there are so many to choose from. Today I would like to tell you about the Kilkenny Arts Festival. Once the medieval capital of Ireland, Kilkenny has very picturesque city centre with narrow winding streets, historical buildings and landmarks. 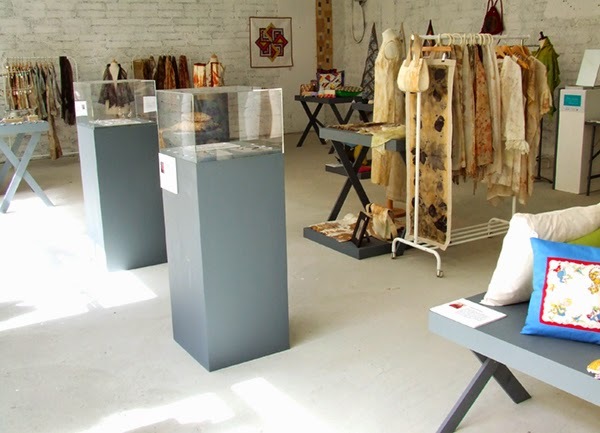 Kilkenny is also renowned as a world class craft centre and every year Kilkeny Arts Festival gather many interested in the following art forms; Theatre & Dance, Classical Music, Music, Street, Literature, Visual Art and Craft. It has been exciting and hands full of work few weeks getting ready for Kilkenny Arts Festival with FORM. Please see the official press release below and a flyer I had pleasure to create. 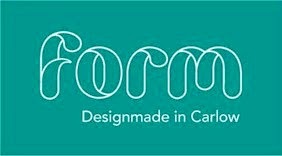 FORM is a group of designer makers and craftspeople living and working in the Carlow region of Ireland. Following their inaugural exhibition at the Festival of Writing and Ideas last June, they will be taking their multi disciplinary talents to the Kilkenny Arts Festival which runs from the 8th to the 17th August. 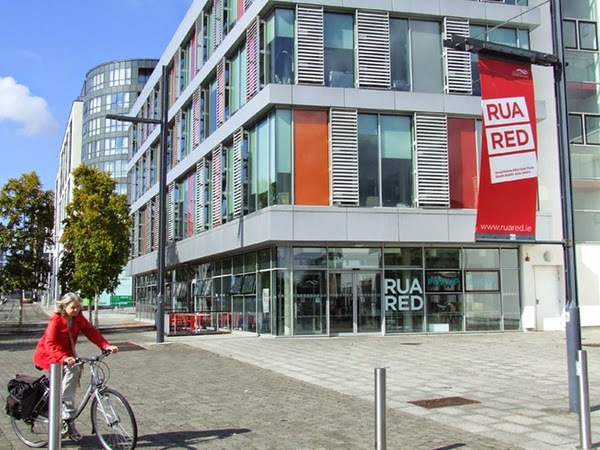 Unit 2, Regency Court on Friary Street is the setting for their exciting new retail happening. 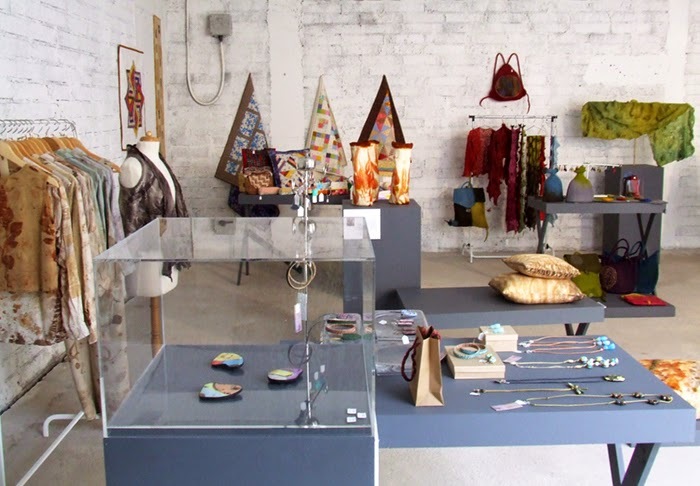 Textiles, ceramics, jewellery and children's wear from some of Carlow's best makers will be on offer so be sure to visit their shop during the Festival. Open daily from 10am to 6pm. Preparation is over, we are looking forward to welcome everyone at our pop - up shop! Here's a sneak peek inside with a section of work on display. 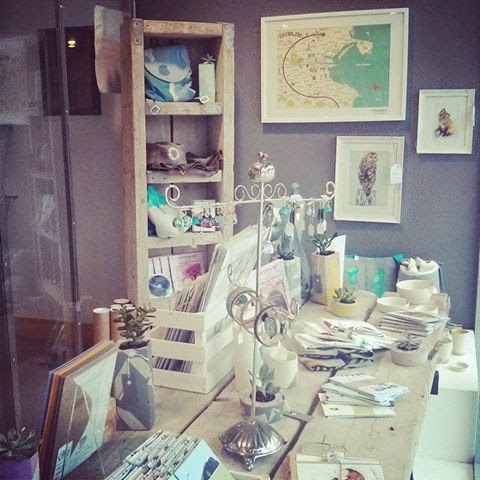 I'm hoping to share more images from the pop - up shop soon, stay tuned! 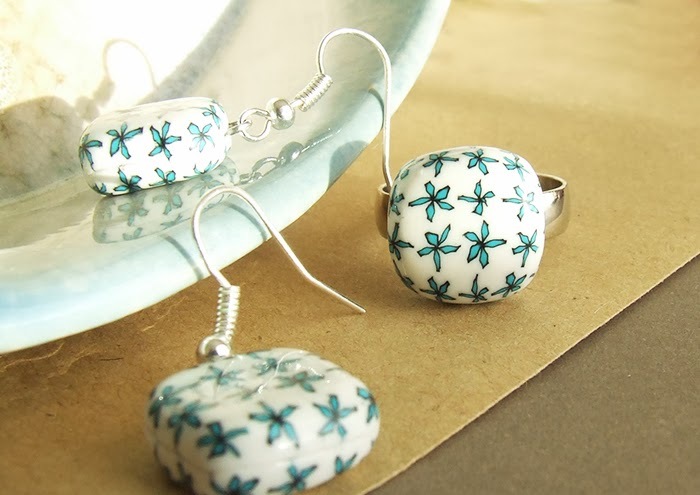 Hollow polymer clay beads have been around for a while and I'm sure there are many tutorials available online. 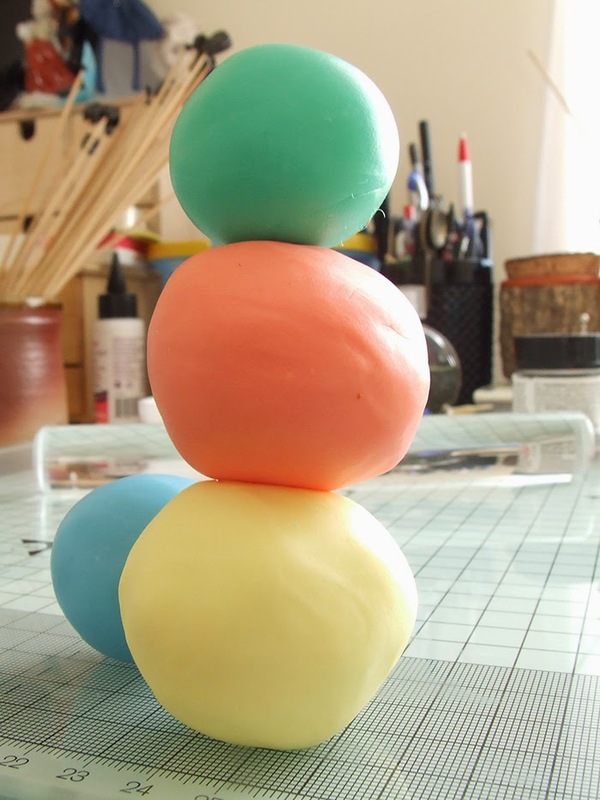 I have seen several great ideas how to build an armature for polymer clay beads and sculptures, especially if the aim is to achieve bigger size. It can be made with help of card stock, wire, styrofoam, polymer clay itself and many other tricks. My hollow cylinder beads developed from the ruffled earring bead design I started to make back in January and the only armature I use are few small foil balls inside the cylinder while shaping the first end and then removed. Once out of curiosity I ruffled and closed both ends instead of just one, very soon I wanted to increase the size and that's how I started to make my cylinder beads. The finished bead is 4cm tall and 2.5 cm diameter and I really love this generous size. 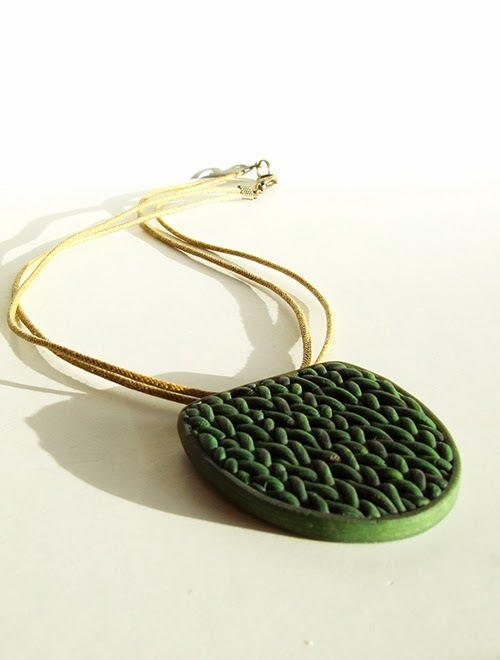 Scroll down to have a look at step by step process and see the finished necklace below. 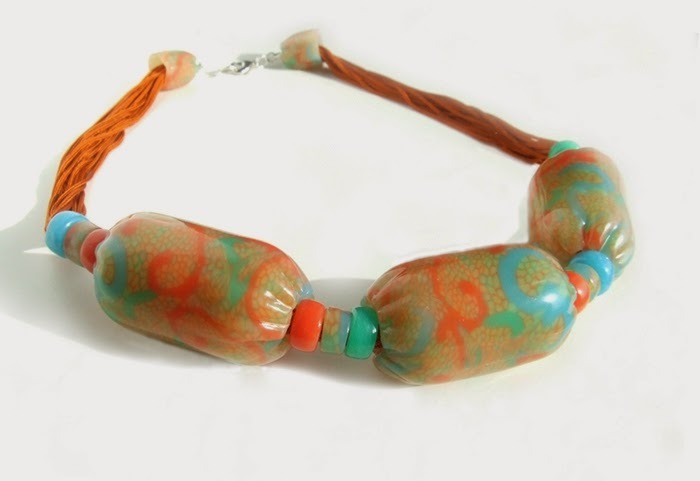 Pictured beads are made from translucent polymer clay in four colours and I have used silk Chinese knotting cord to string beads. Yellow Pleated Necklace by Valg Studio, photography by Rory Moore. The Summer does seem to slow things down a bit, it is holiday season after all. Quiet lazy days, more time spent with family and more time for myself. It's natural to look back on the first half of the year, summarize, think about experiences and concentrate further. More trips to the seaside and strawberries from the garden are some of the summer treats, but of course I'm also working. New designs taking shape with new tools bought recently and I also enjoy experimenting with translucent layering technique I learned from Kathleen Dustin at workshop in Malta. Many things have been accomplished during these months, but the greatest gift have been meeting all the wonderful and special people. Would it be my mum, friends, professionals, like minded people or somebody I will probably never meet again. Today I would like to tell you about Daniel Torres whom I met during the EuroSynergy Conference. He is wonderful man and artist and recently has started a new blog - The Creative Entrepreneur Daily. Daniel says it's intended to be a celebration of everything creative and entrepreneurial - or both at the same time. Information on the blog is very helpful and interesting. Well worth checking out! 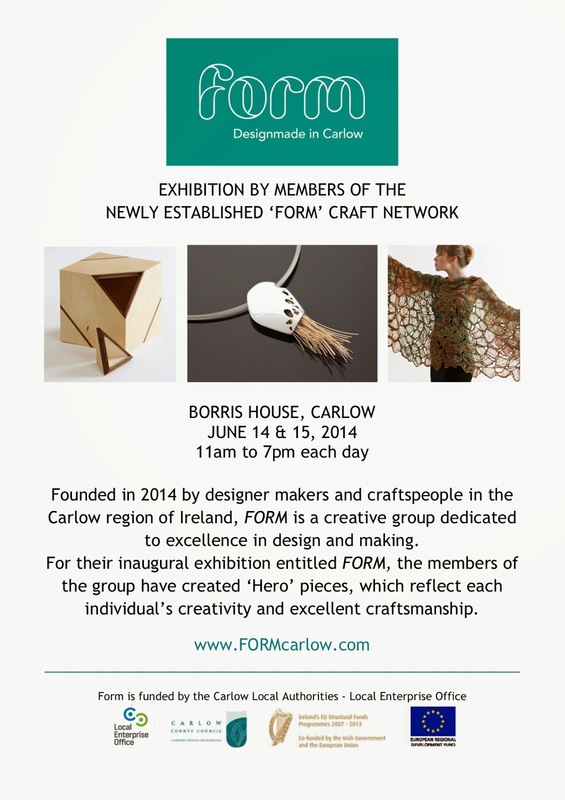 FORM Designmade in Carlow first joint exhibition at Borris House during Festival of Writing and Ideas. Have a great summer and talk soon! The members of FORM Designmade in Carlow is looking forward to welcome visitors to their first joint exhibition this coming weekend. 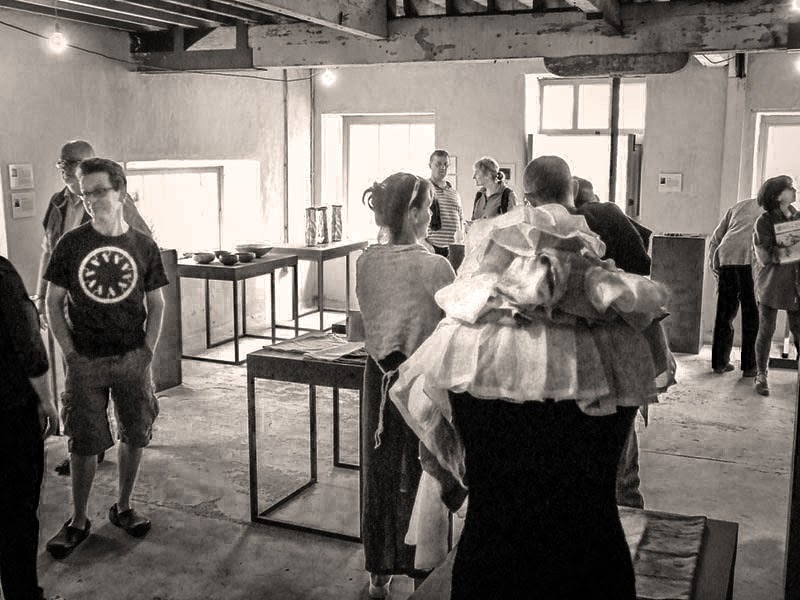 Exhibition is part of Festival of Writing and Ideas which takes place at Borris House over the weekend of 14th and 15th June 2014 . It has been quite a busy time in the last few months. Four pieces for the exhibiting are now finished and safely delivered to the Borris House for the set up. Work from all members will be on show in the restored Laundry Building. 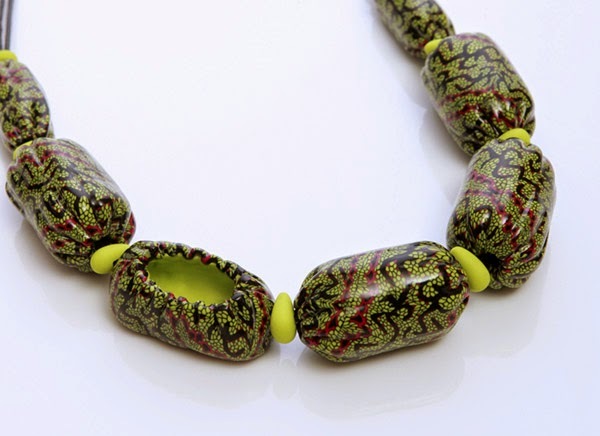 My "Les Bonbons" necklace was inspired by desire to create design with large hollow cylinder beads and chosen pattern reflects lace elements and the idea of beautiful wrapping. I have used canning technique, hand shaped forms. My new "Fragment Series" brooches will also make their debut at the weekend. They are inspired by the architectural exterior details I have always enjoyed looking at. Using heat set oil paints and translucent layering technique to combine lines, contrasts and ornamentation I have created abstract designs from existing and imaginary buildings. I'm looking forward to enjoy and celebrate this special exhibition. Everyone is welcome and of course there are many other events taking place this weekend in Borris and in Carlow region as a part of Carlow Arts Festival. It is important to know that there are others around us who share the same values and aim for the same goals. I'm glad to have this invaluable support from designer makers and craftspeople living and working in the Carlow region of Ireland. 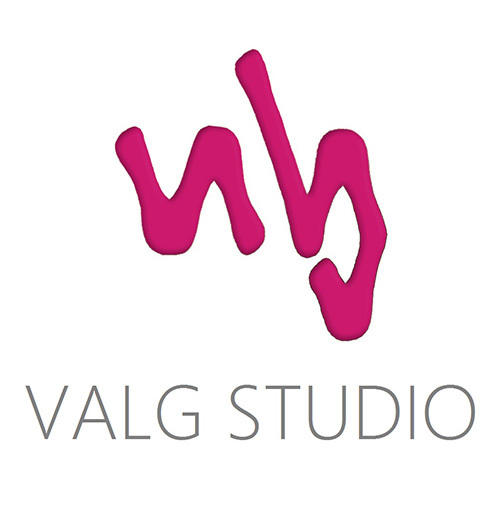 I remember it was last year in August when I first realized that Valg Studio could be a part of unique craft group in the future. Many months has passed, a lot of work gone into the setting up FORM Designmade in Carlow collective and the group was officially launched on the 14th May at VISUAL Centre for Contemporary Art in Carlow. Ariane Tobin, Liga Valge, Catherine Sothern, Emma Jane Champley, Glenn Lucas, Martin Marley, Nicola Brown, Stephen O’Briain, Tomomi McElwee, Cillian Ó Súilleabháin, Leiko Uchiyama, and Maria Ryan are the artists. Group has amazing facilitator Frances McDonald, under her professional guidance group is now looking forward to the first Group exhibition during Festival of Writing and Ideas at Borris House on the weekend of 14th and 15th June 2014. This event is also part of Carlow Arts Festival offering a vibrant and dynamic arts programme during 10 days in June. 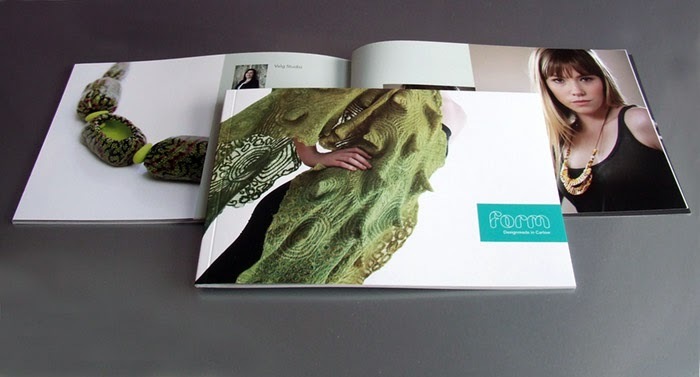 It is a great pleasure to hold our first brochure, beautifully designed and rich with eye-catching images by Rory Moore. If you spot it in various places around the Co. Carlow don't hesitate to pick it up. You will definitely find it in Carlow Tourist Office. Overwhelming! Perfectly describes the EuroSynergy experience in Malta last week. There were so many things going on, including, hands-on workshops, great seminars and presentations, shared experiences, mixed emotions, new friendships, inspiring moments and surprises just a few to mention. 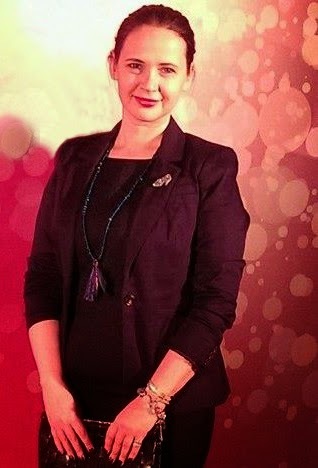 I'm very grateful to EuroSynergy Committee for organizing it and everyone who made this event so special. Of course it will take a while to reflect and take the next step, but I think the answer is hidden in this year's conference theme title - Together: New Vision. During IPCA Synergy Conference I didn't take many photos and didn't have much time for sightseeing, but luckily there is EuroSynergy 2014 Malta pin board created on Pinterest to have a better taste of this amazing gathering with participants from 29 countries worldwide! there will be more information about it online very soon. 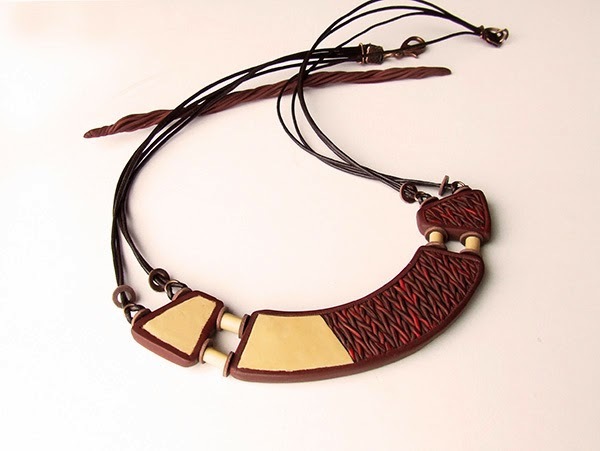 First I would like to finish the pieces I started in the three pre-conference workshops and then I'm really looking forward to start working on new designs. EuroSynergy is the keynote conference in the polymer clay world organised by the International Polymer Clay Association and I'm delighted to have opportunity in three weeks time to travel to Malta and be part of it. It is even more exciting because it is the first major IPCA event to be held outside the US and it promises to be great networking event with artists from all over the world. 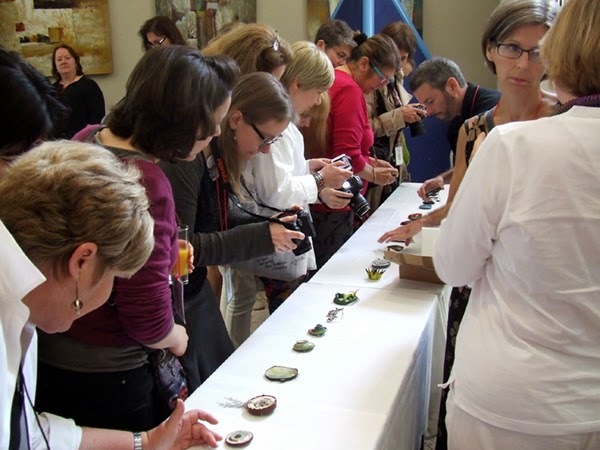 There will be so many amazing seminars to attend, gallery with fantastic work to admire and buy, meet new and old polymer clay friends, plus I have booked three pre-conference workshops, but I believe there will be many other great things going on. 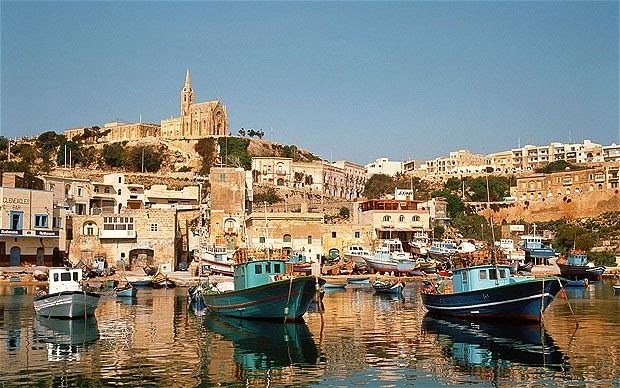 Also I'm hoping to see and experience a little bit of Malta's heritage and nature. Very soon I will start to pack my luggage, will have to make sure I have everything I need for Rose Collar, Translucent Layering Techniques and Don't Ya Mess With My Circles workshops. I will also bring a selection of my work because I have applied for the Gallery table. I may also need new summer shoes and sunglasses - it will be around +20ºC at the end of April! Recently I created Malta board on Pinterest and thought it's so colorful and exciting country the same as polymer clay is! If you are interested to take part it's not too late to register, have a look at EuroSynergy website, all the information about seminars, workshops and venue are there. Brooches are an excellent way to accessorise yourself and to add that final touch that will complete your look doesn't matter what's the occasion. In this blog post you will find short musings about how to photograph jewelry and images with Shoe Brooches. 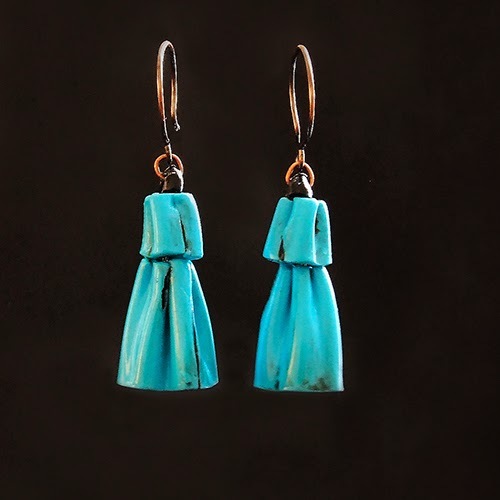 More and more often I hear that it is recommended to have modeled photos for your wearable items to promote them better, especially if you sell online, for example on Etsy or your own website. I agree that it is easier for customer to imagine how the jewelry will sit on a real human body and also well modeled photos can get lots of attention, but there are some good reasons why people avoid using models too. I found great article "Using Live Models when Photographing Jewelry - Yes or No?" very informative. I have to find the perfect way to present my work yet. Even though I have couple images in my Etsy shop I modeled myself and I think they turned out alright, I really enjoy photos where the jewelry is seen worn by its owners. 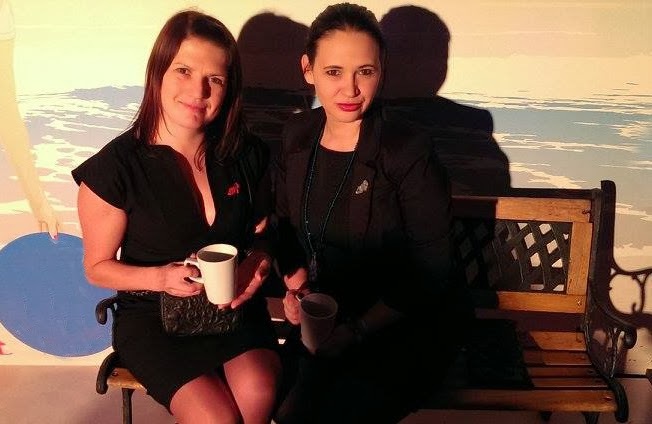 Like these two lovely ladies wearing my Shoe Brooches recently. Very feminine looking! I couldn't be more happier! I'm also sharing two pictures I took a while ago for my Etsy shop to help the viewers get a better idea of how the Shoe Brooch would look on. It's definitely not an easy job! 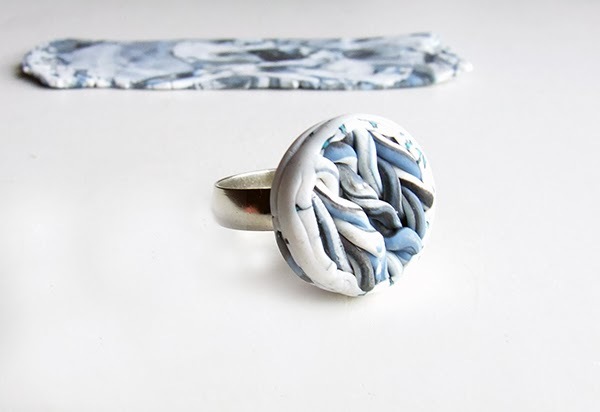 Please feel free to add your thoughts or experience about using models when photographing jewellery and also have a look in Valg Studio Etsy shop for some shoe brooches available at the moment. Why not?! 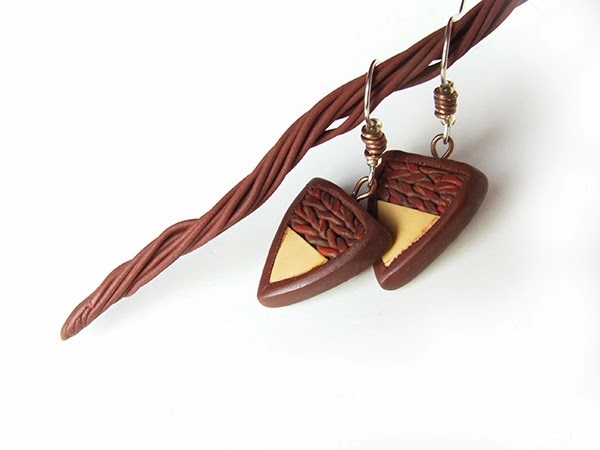 Actually it is quite simple to knit with polymer clay. If you are interested to know a little bit more about this technique have a look at one of my previous posts here. It is natural to think about knitting and knitwear - cosy jumpers, scarves and warm hand knit socks when it's winter. 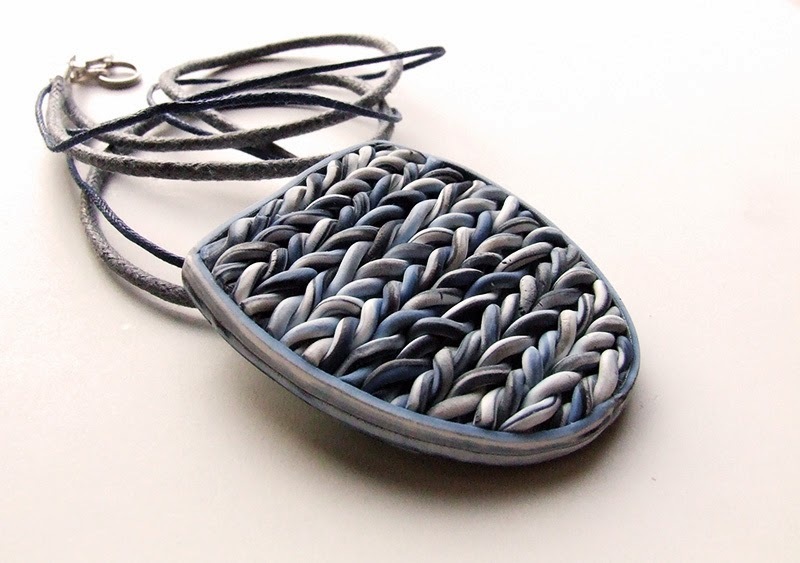 It is still cold, wet and quite miserable weather wise here in Ireland and so I thought it would be good time to show some of my recent polymer clay knitting. The good news are that I won't need to pack them away when it gets warmer. I would like to think these accessories reflect the warm and comfy feelings we have when we wrap up warm in the winter, but the best part of it is the excellent texture. 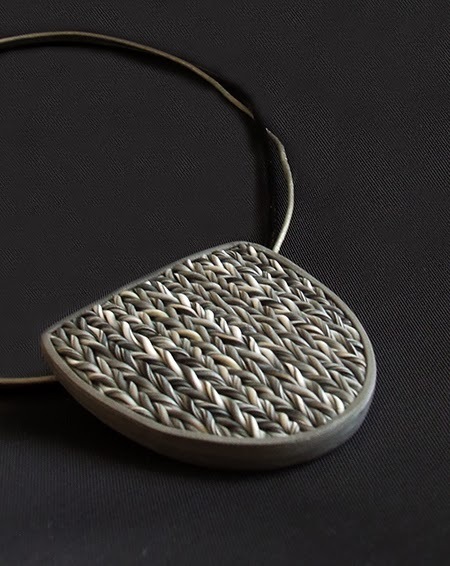 In my opinion this jewelry will look great with simple jersey top or dress. 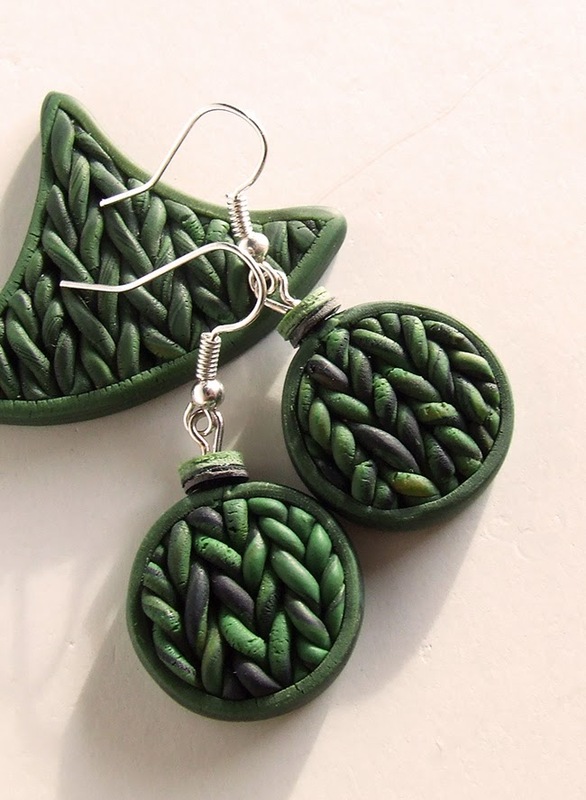 For the most of my accessories I have mixed two or three colour polymer clay, it can be one color if that is what you are looking for, but multiple colors better show texture and has great effect. 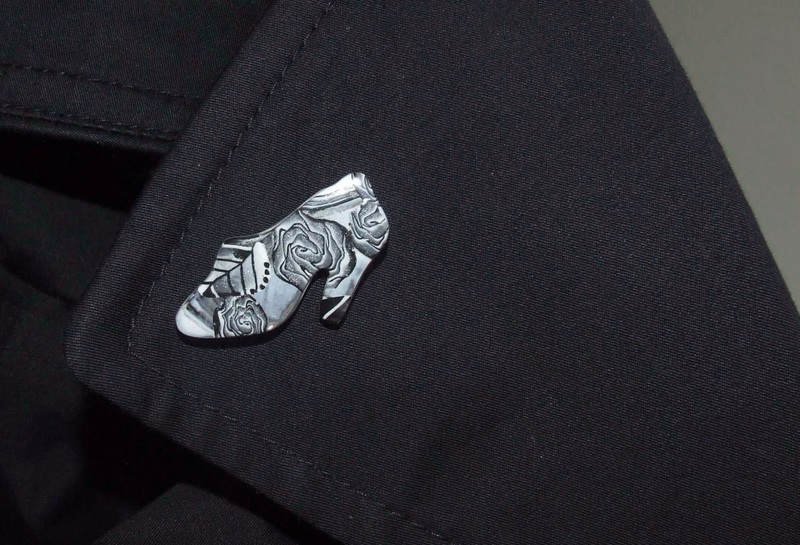 My favorite is the Black and White Swirl lapel pin. What catches your eye?! Most of the items you can see here are available at my Etsy shop online here. 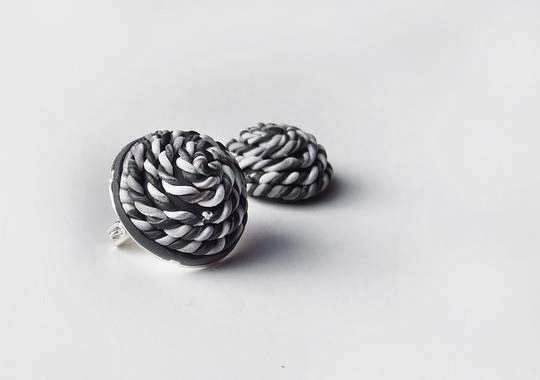 Black and White Swirl lapel pin. 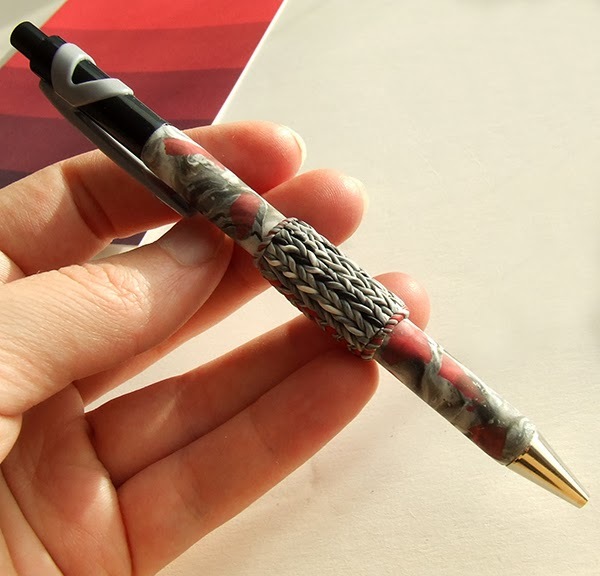 Pen with Faux Knit Detail. 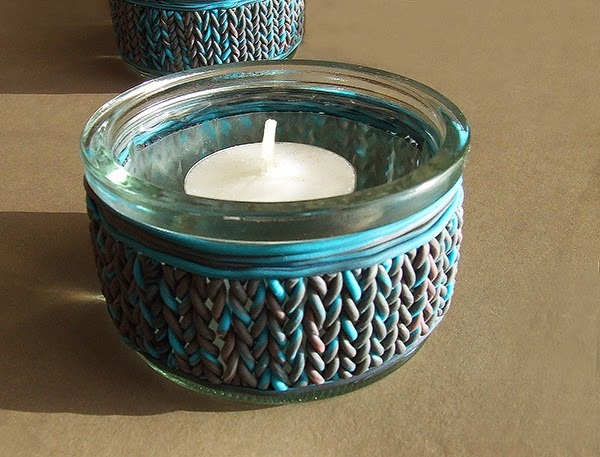 Blue and Grey Tea Light Holder.